Every issue of MPT crosses frontiers. Contributions come in from all over the world. Copies go out world-wide. Whatever their subjects, the translations themselves, out of many languages, cross frontiers of space and time. MPT 3/11 concentrates on that essential act, and makes connections of many kinds – of going-betweens and crossings-over. There are frontiers between species, countries, creeds, classes and generations; between the sexes, between life and death, between then and now… And poetry has always gone out to these boundaries, to survey them and to cross them. Some passages are customary and welcome; others are more like smuggling and transgression… Some borders are open; others are walled, barb-wired and mined… Contains previously untranslated poems by Bertolt Brecht. Poems from this issue were featured on the ‘Borders’ edition of the BBC Radio 3 Words and Music programme on Sunday 3rd January, 2010. For more details on the programme see the BBC website. 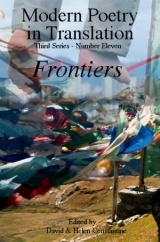 ‘Frontiers’ was reviewed by the Guardian, here.